I wear him because I miss him when he is not in my arms. I wear him so he won't be crushed by his siblings. I wear him when I want him to go to sleep. I wear him when he needs to nurse and I am not at home. No one even knows I'm nursing when I do it in a carrier. I wear him so I can push the grocery cart. I wear him so I can get things done around the house and he can be with me and we can be together. I wear him because every single time I put him in the bassinet, one of the older kids wakes him up in under a minute. I wear him so I can hold Alice's hand as we walk to get Clark from preschool. I wear him because it feels just like holding him, and I hold him because it feels right. In a blink I will realize that he is big, too big for me to wear or hold or carry. Even if my heart wants to. This is our time. It doesn't last long. He is fuzzy and squishy and smells like sugar. Why would I want to put him down? You can see in my photos - holding my babies in carriers is just like holding them in my arms. Strollers are a new thing. Women have been carrying their babies with help from a carrier forever and ever and I honestly don't know how I would go about my daily life as a mother to three small children without utilizing this natural and age-old practice. 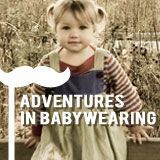 My lovely friend Steph from Adventures In Babywearing is hosting a babywearing link-up to spread real life information about the safety of our baby carriers and how we use them, in the face of CPSC recalls. Link up your photos and/or stories over at her place and you could even win a Sakura Bloom ring-sling. Will you join us? "Truly, it [babywearing] does not require special skill. There is no "if done properly." We are working to ensure that babies are kept safe all the time, and babies in slings are safe. They are in the safest space besides a mother's arms. PS. I was planning a great big THANK YOU post for your comments on my Target story, but Steph posted her call to action and I typed this up so I could participate. Thank you thank you thank you my friends for your kind and supportive comments. I almost don't feel dumb about it all anymore. (Almost.) You are wonderful. PPS. I realize it sounds like I never ever put him down and that is kind of true but very honestly? It is mostly because of the siblings-hurting-him thing. I have worn each subsequent baby more than the last, and I'm so glad I have it as option to keep him up where the older kids can't crush him or try to pick him up or feed him raisins. awe babywearing. I'm not sure I could manage 3 kids without it. Great words. Love the "strollers are the new thing," line. Millions of moms (and young girls) are tying babies on and heading to work today, and they know what's safe. I was thinking along the same lines, Erin. like, maybe the CPSC should inform indigenous peoples about the dangers of their modes of carrying their babies?? craziness. Sometimes it's a necessity! (wearing them) and to be honest, it's why I thought about it with Gray in the first place- thinking, where am I going to put the THIRD one? :) So glad I found it. And I found that Gray and Ivy were totally different babies- Gray NEEDED to be in the sling all the time, Ivy- not as much. It's just such a wonderful and comforting thing to be able to have them so close and SAFE. Such sweet photos. Babywearing makes my heart kind of mushy. And, yes! Women have been babywearing since the dawn of clothing. Yet, the human race still managed to carry on the vast majority of that time without the CPSC. You are so right about wearing the 3rd baby - I don't know how I would have gotten anything done, gone anywhere, helped my older littles, etc without wearing that little guy. Plus, I just absolutely loved holding my babies. I still do. I love this post with all of those reasons...they were my reasons, too. Don't tell Michael. But this post and reading everyone's comments just made me hug myself and imagine a little baby in my arms. I even said "oh a little baby" out loud. Don't tell Michael, you internet. Don't tell my mama either. She'll be all over this. Yay for baby wearing! What types of slings do you use/love the most??? I'm looking to add a new one to my collection now that we're having a new baby girl (due this Thursday!!!). Loved the beginning of your post. It was very poet-y. I feel the same, especially about how this is our time, it doesn't last long (tear) and why would I want to put him/ her down? I should have written in my post! I have three slings/carriers and use two of them a lot. The Kangaroo Korner adjustable pouch sling is what I am wearing Hal in in the photo. It isn't a low pouch it's a deep pouch more similar to a ring sling, I think? Anyway I wear it with my babies tummy to tummy. I like that it is quick and easy and that is adjustable so tiny babies can be snug. I don't like the way it limits the use of one of my arms. I've always wanted to try a ring-sling instead but haven't had the funds. My second carrier is a Moby Wrap. Great for newborns and when your baby needs to nap or you are going to wear them for a long period of time and you need them to be resting (family party at 7pm?). I have been putting it on at home before we leave the house and then popping Hal in and out as we run from store to store. It's a little too awkward for me to put on in a parking lot without the pieces dangling on the ground and people staring. Not that I never have! My third carrier (the flowered one) is an Angelpack LX. Kind of like a Beco outwardly but actually the most similar to an Ergo. There is no insert or fabric between you & baby. You just hold baby against your chest how you would hold them in your arms, tummy to tummy, and then put the fabric over them and buckle it. It is easy and quick to put on and super comfortable. I used it literally every single day with Alice from about 4-14 months old. It has been everywhere with me. I love it. You are adorable. Stunning, really. I didn't realize that you wear glasses sometimes (they look great on you). I know this post is old, but I too wore my baby mostly to keep him safe from my older son, and I felt like letting you know. I also felt like letting you know that I adore your blog, and I can so relate to so much of it that I feel all giddy, like I could just share out my life story with you right here in the comments...but that would make a really long comment, and make me look like a crazy person, so I won't. But I do really love your blog - and I envy your photography skills!